Why you should have “Save Basket” options on all e-commerce sites | TransPacific Software Pvt. Ltd. Allowing a user to save basket for later purchase is an extremely useful feature for both user and store owner. Save basket : A must have feature for high value e-commerce sites. Let’s take an example of a jewelry or Diamond e-store. When a user finalizes on a diamond ring by selecting the design and metal she will seldom go for immediate purchase. Rather she would prefer to save her selection for later. May be she wants to take her time to make the final decision or consider taking opinion from friends. Does your site have a feature to allow her to save cart/ basket ? “ Save Cart” is different than wish list or abandoned cart. Adding an item in “Wish list “ is a casual way of shortlisting items. Buyer is still at a distance from getting converted. Where as abandoned cart is “still to be investigated” process where in store owner needs to put in considerable effort to find why the cart is abandoned. In contrast a saved cart means the buyer is close to getting converted and a simple e-mail offering assistance can get you a conversion. 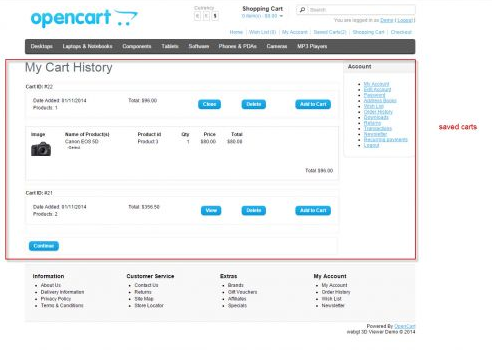 OpenCart “save basket “ extension by TransPacific Software. TransPacific recently released its “ save basket” extension for opencart 2.0 + available on Opencart Extensions. It allows a user to save his shopping cart and also sends an automated mail to store owner when a user saves the cart. Items are saved in the cart along with the options (eg. color, size) selected by user.